STOKE returned to winning ways as they defeated local rivals Buxton Hitmen 52-38 in the Travel Plus National League at Hi-Edge Raceway on Sunday afternoon with skipper Max Clegg racing to a faultless 18 point maximum. Buxton opened proceedings with a 4-2 in the opening heat as Ben Wilson and Lewis Whitmore got the better start before Potters guest Anders Rowe managed to drive underneath Whitmore to take second place. 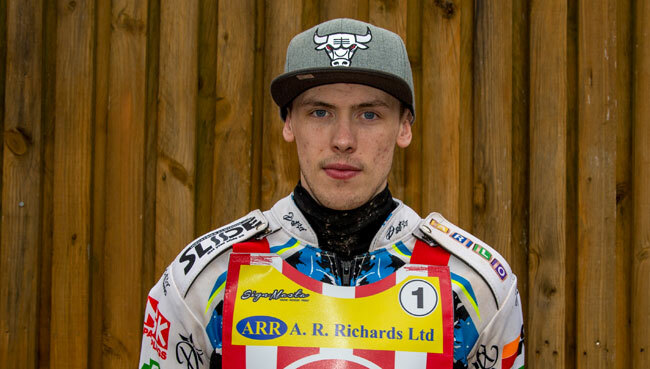 The Potters drew level in the third as Potters skipper Max Clegg came out as the rider replacement and duly delivered taking victory from Tom Woolley with David Wallinger third. The Potters once again fell behind as Hitmen guest Joe Lawlor and home skipper Woolley combined for a maximum 5-1 over Rowe who tussled for the whole four laps with Woolley holding the Potter at bay. The Potters then struck with a 5-1 from Wallinger and Alcock over Douglas and then a further 4-2 from Adam Extance and Burnett Paul Burnett followed on by two further 4-2 advantages from Clegg and Alcock and Rowe and Extance along with a 5-1 from Extance and Wallinger put the Potters into a 38-28 lead after eleven races. Heat twelve was stopped with the Hitmen on for a 5-1 but Buxton reserve Pavitt lost control and fell with Potter Wallinger unable to avoid the stricken Pavitt as he went over the top of the youngster. Wallinger walks back to the pits but Pavitt is taken off the track by ambulance. Pavitt is excluded from the restart as the primary cause of the stoppage while Burnett replaces Wallinger. Woolley takes the victory from Burnett with Alcock third for a drawn heat. Clegg takes victory in the next race with Rowe third with Wilson splitting the Potters pairing for a Stoke 4-2 heat advantage with the Potters leading 33-45 with two races remaining. The Potters sealed victory and took all four points for an away win with a 4-2 heat advantage in the final race as Clegg defeated Lawlor to take the chequered flag with Rowe taking third to give the Potters a 38-52 victory.